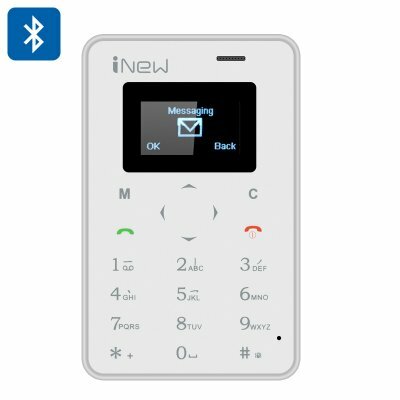 Successfully Added iNew Mini 1 GSM Credit Card Phone - Quad Band GSM, Camera Trigger, 320mAh Battery, Bluetooth (White) to your Shopping Cart. When it comes to small compact phones they don't get much smaller than the credit card sized iNew Mini 1. Weighing just 29 grams and with similar credit card size dimensions this 4 mm thick phone can slide into your wallet, purse or a small pocket and takes up virtually no room at all. The iNew Mini ! brings you quad band GSM connectivity brining it great network coverage across 850/900/1800/1900MHz frequencies. A bright OLED display and responsive touch pad makes this compact phone easy to use. As well as working fully independently you can also use the iNew Mini as a Bluetooth addition to your Smartphone. just use its Bluetooth connectivity and sync it to you Smartphone then you can answer calls, play music, make calls and even use it as a remote trigger for your phones camera. The iNew Mini 1 credit card sized phone comes with a 12 months warranty, brought to you by the leader in electronic devices as well as wholesale GSM phones..